Marvel Studios can do no wrong or at least have not so far. Their slow world building towards their team up movie The Avengers has changed the landscape of blockbuster entertainment. Studios no longer want a trilogy they want a franchise. Why lock yourself into one star with one character when you can have various ones all part of the same franchise allowing you to release not one hit film every two years but at the bare minimum two films every year. As comic book adaptations continue to reign supreme they have a sizeable chunk of the market with their line-up of characters. Cynicism aside like Pixar before them part of the success comes down to the reliability of their brand. The studio is run by comic book people who love comic books and their characters. Whatever changes they’ve made in adapting to the big screen they’ve always strived to service what was likeable about a character or storyline. If you think about it, the spin offs before Avengers didn’t make as much money as their sequels, it’s easy to forget how much of a gamble this all was way back in 2008 but if you’re worst film is Thor: The Dark World you’re batting average is likely to be game winning. So the question becomes how long can this success last? If Avengers: Age of Ultron didn’t quite deliver on high expectations Captain America: Civil War suffers no shortage of anticipation. Last November when trailers for this summer’s blockbusters debuted Civil War stood out for its more polished editing. The closing shot Steve Rogers (Chris Evans) looking emotionally pained as he slammed his shield down on Tony Stark (Robert Downey Jr.) stood out to me. That close up communicated instantly what is at the heart of this story and also the success of the Marvel brand. They bring it back to the characters and what they are feeling rather than just straight spectacle. 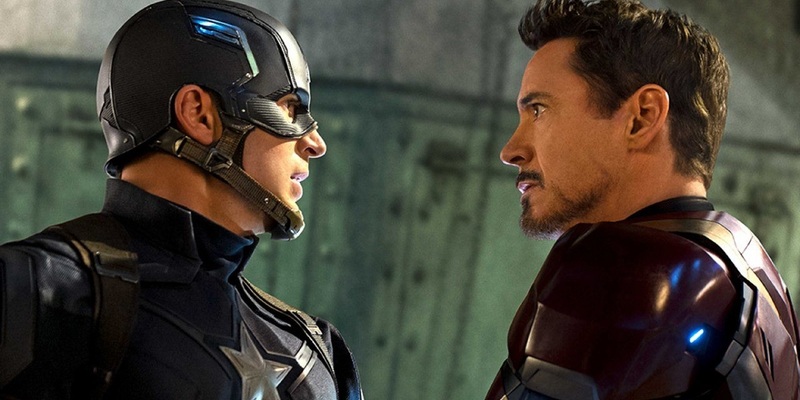 Captain America: Civil War delivers on every front we’ve come to expect; there is a spectacular joyful smack down in an airport that has already become an instant classic. There are multiple characters with their own motivations, story and stand out moments juggled effortlessly. Amidst all the special effects are some effective practical stunts, witty dialogue and heart. Heart first and foremost always in the telling of the story. If any of these films have flaws it is not for lack of heart which is an even grander achievement when you consider the assembly line production of them. There are pay offs here that are built on history that has been developed over 8 years and 12 films. The film opens with the latest line-up of Avengers Africa to take down Cross Bones (Frank Grillo) but in the ensuing melee there is collateral damage and this raises the possibility of whether the Avengers do more harm than good. Enter the Sokovia Accords which would effectively mean only the governments of the world could approve the use of the Avengers unilaterally and could effectively lead to the misuse of the Avengers for those countries own ends. Captain America does not trust oversight given Hydra’s recent infiltration of S.H.I.E.L.D. and Iron Man can no longer stomach not taking some responsibility for their actions in a similar vein to when he ceased arms productions at Stark Industries. The rest of the team for various reasons fall down along these lines, neither is particularly wrong or right but as a fellow blogger pointed out there are more fascinating avenues this line of thought could have been developed beyond just collateral damage. In the end the film while being a powerful parable about the cost and cycle of violence is ultimately an elaborate excuse to see various heroes fight each other. Which is fine because the film is not really about the Sokovia Accords, it is about Bucky Barnes (Sebastian Stan) and what lengths Steve Rogers will go to protect his friend and fellow veteran while at the same time Tony Stark is trying to protect the Avengers as best he can. Stark and Rogers have always been at odds with their contrasting personalities and world view points. There is an extra layer there in the sense that Rogers is partially a creation of Howard Stark’s and a friend of Tony’s Dad. He’s perversely both father figure and rival son for Stark Senior’s approval. The ground work for this had been laid previously and in this film finally gets paid off. With that in mind it is remarkable how two major new characters are introduced and immediately feel right at home in this universe and have their own storyline. Spider-Man is introduced with hot Aunt May Maries Tomei and features only in two scenes. One his introduction is a remarkable feat of economic storytelling in setting up his character and the second an unadulterated celebration of what we love best about that character in the airport scene. We know everything we need to know about this Peter Parker (Tom Holland) from those two scenes and we’re hungry for more. Featured more prominently is Black Panther who has his back story partially told and is set on a path for vengeance against The Winter Soldier which brings him into direct conflict with Captain America. He is not the only one and it says something about this franchise in where they are prepared to go with their lead characters. Certain characters may not get much to do, Scarlet Witch (Elizabeth Olsen) and Vision (Paul Bettany) have certain moments that hark back to the comic books, Falcon gets a lot to do but is still mostly defined by his friendship to Rogers, Hawkeye (Jeremy Renner) looks great and is cool but doesn’t have a lot going on and the same goes for Black Widow (Scarlett Johansson). Black Widow though is this solid link throughout the story. Rogers and she have been through a lot, she may not be on his side but she looks out for him as best she can. Performances are all uniformly excellent. If the film has a flaw it maybe that it kinda lacks a strong ending, the villain has been cited as weak even by Marvel standards but to me it fits given that in this film the enemy is within. Daniel Bruhl’s performance is effective at showing that character’s pain and it is an interesting idea for a villain. Production values are great across the board; the directors Anthony and Joe Russo continue their impressive staging of action even if an early chase does employ some disconcerting shaky cam. While most scenes seem to be set in technology parks or airport hangars perhaps reflecting the need to maybe switch up the locations more in these films these really only are nit-picks. This studio has delivered for us again and again, that at this point a superior production in every way to their rivals is not enough for some fans. There is a hint of franchise fatigue with this entry, a little bit too much familiarity even if the quality remains high-people inevitably seek out something new and fresh. Guardians of the Galaxy and Ant-Man delivered on those fronts and even Iron Man 3 because it remained steadfastly a Marvel and Shane Black film. Getting more strong auteurs in there may not be a bad idea but for now the future looks bright with a focus on new characters with Dr. Strange and Black Panther coming next. For now this is arguably as good as anything Marvel has done, check it out.